Thai green curry was the first proper oriental meal I cooked on my own, when I was about 13. I found a Blue Dragon kit in a shop and had never had a Thai curry before and thought the kit, with its green curry paste, fish sauce and lime leaves looked very exotic. Since then I have always been a big fan of Thai curries, especially after discovering Mae Ploy brand curry pastes in Akram’s supermarket when we lived in Southsea (if you are ever in Hampshire near Portsmouth, check out this amazing Aladdin’s cave of Chinese, Japanese, Korean and Indian ingredients- it is an amazing place!). 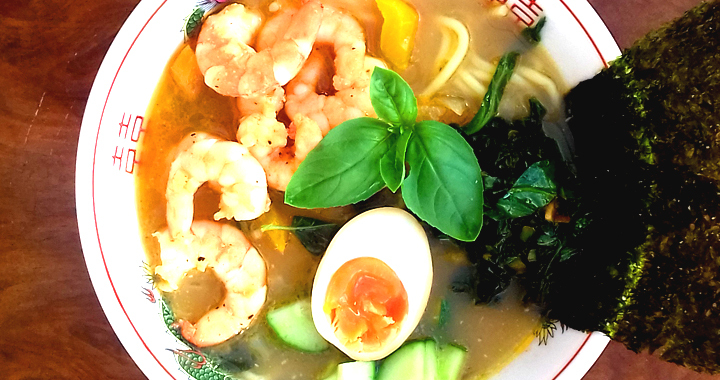 At the weekend I was craving ramen and wanted to use up a tub of fish stock I had and from looking at what ingredients I had in my cupboards and fridge, this fusion of Thai and Japanese was born. You can substitute red or panang curry paste if you prefer it to green in this recipe. Please note that if you use Mae Ploy brand curry pastes- they are very pungent and spicy! Any Thai curry paste you find in the world food isle of the supermarket will work, but I find Mae Ploy make the most authentic curry! To accompany: This was cooked on the hottest day of the year so far, so I made a cooling class of iced matcha to go with this meal. Find my matcha guide and recipes here. Melt the coconut oil in a large wok on a medium heat and add the shallots. Cook until softened and add the curry paste until melted and aromatic. Add a little of the stock until the paste is incorporated and then add the rest of the stock. Add the lime leaves, sugar, lemongrass, fish sauce, ramen egg mixture and coconut milk and mix well. Allow to cook together for the flavours to infuse for 5 minutes. Add the pepper and allow to soften. You ideally want it to have a little bite still when served. Cook the ramen noodles as per pack instructions. Add the basil leaves to the green curry broth just before serving. Drain the noodles and divide between two bowls. 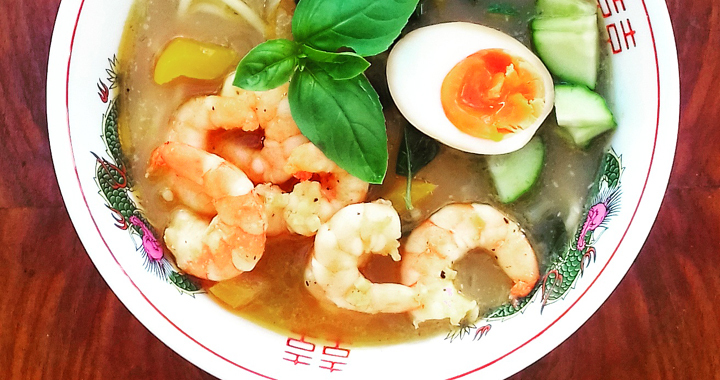 Ladle the broth over the noodles and then top with the prawns, stir fried greens, half a ramen egg, cucumber, nori and a sprig of basil. Wash the leaves and pat dry with kitchen towel. Fold over and roll up then slice thinly to create thin strips of leaf. Heat the oil in a pan and add the garlic. Fry until aromatic and then add the leaf greens. Fry for a minute then add the soy sauces. Fry for five minutes (less for lettuce!) until wilted and cooked through. If the pan becomes dry add a little water as you cook it. Sprinkle with white pepper. Drain the prawns and rinse in cold water. Melt the coconut oil in a wok on a high heat and add the garlic. Cook until browned and aromatic. Add the prawns and stir fry. As they start to turn pink, add the sriracha sauce and stir to cover the prawns evenly and continue frying until pink. Season with salt and pepper before serving. Posted in Ramen Dishes, Recipes, Uncategorised and tagged Fusion, Prawns, Ramen, Seafood, Thai.